Nice quality paper in a spiral bound book. The Musicians Choice. This edition: Mozart Red. 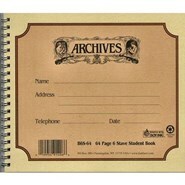 Also available in Dvorak Orange and Schubert Yellow, Stapled. 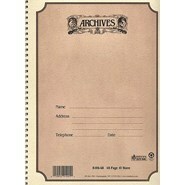 Alternates between pages with stave lines and pages with writing lines. Culinary Harmony, a fascinating recipe book, reveals the culinary tastes of the world's finest classical musicians. By David Rezits, published by DIR publishers in 1997. The front cover features the Emerson String Quartet. Humorous music/food illustrations are by Lisa Scott. Recipes range from amazingly tasty to amazingly humorous. We only need to cite "Peter Schickele (AKA PDQ Bach) "...I like cooking. It's one of my favorite things to eat. I would much rather ingest someone's cooking, than say, the contents of his pencil sharpener..." or the wonderful Indian Rice Salad of bassoonist David McGill. Musician's practice planner. Includes weekly lesson plan and daily practice log pages. This effective and easy-to-use best seller is a favorite of musicians worldwide! 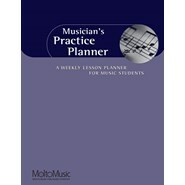 Proven successful in private lessons and in the classroom, the Musician's Practice Planner is a must-have fro teachers, students and professionals alike. Tailor its use to each individual student. A personal memoir by Sherry Kloss, pupil and master-teaching assistant to Jascha Heifetz. Published by Kloss Classics, 2000, first printing, soft cover, 169 pages, photographs. The Violin Owner's Manual is an indispensable guide for the string musician. The "missing manual" for string instrument owners - what every violin owner should know. Here's the book that should have come with your violin! Written by a team of leading instrument makers, repairers, and musicians under the expert guidance of the editors of Strings magazine, the Violin Owner's manual is the one comprehensive guide to selecting, understanding, preserving, and protecting any violin, from a modest fiddle to a priceless Stradivari. If you play the violin, teach others to play, work with violins, or buy and sell them, this is the indispensible reference for you - written in clear, jargon-free language and richly illustrated with photographs and drawings.